I began to gather my thoughts for this article one evening while listening to Radio 4 (what else?). A group of railway enthusiasts were being interviewed about a trip to China, for steam, and one of them proceeded to give a definition of the different types of enthusiast - number crunchers, linesiders, bashers and plain gricers. I suppose we're all slightly mad, in different ways! I'm not not sure what the correct classification for track gricers is, nevertheless the thought of travelling with the Branch Line Society had filled me with some trepidation! The Irwell & Mersey Rambler, organised by the above mentioned august body, ran on Saturday 14th November 1987, with a most convoluted route around the North-West of England. It was to start from Crewe, but would run south to Stafford before heading north again, and it was at the latter that I joined the train. My travelling companion once again was el presidente Steve, who had joined the train at Crewe, partly to ensure we got reasonable seats on the fully booked train. The train duly arrived, about 5 minutes late, and departed promptly. Steve had managed to obtain seats in a bay position in the centre car, a class 104 trailer second sandwiched between two class 108 power cars, so we had a reasonably comfort able journey. The reason for the run to Stafford was to enable the train to gain the independent lines, the freight only "muck 'ole" avoiding Crewe Station. Incredibly, the train could not be permitted to reverse and cross over the running lines anywhere further north than Stafford. We then ran quickly up the Manchester main line as far as Stockport, where we took the Stalybridge route from Heaton Norris. Nearing Guide Bridge, we then took the Ashton Moss line at Denton junction, swinging left towards Manchester Victoria at Ashton Moss. Instead of running down the bank to Victoria however we turned sharp right round the back of Miles Platting station, and ran to a stop at Newton Heath, with its lines of DMUs. We now reversed, and headed once again towards Manchester, only to stop at Cheetham Hill junction, reversing again to gain the Bury line. The run to Bury could be described as entertaining, as at each station we watched passengers move towards our train, only to watch it run straight through. Clearly non-stop trains are not commonplace on the Bury line. The Bury line is of course unique, with its 1200v dc side contact third rail, dating from the L&YR. The trains themselves do not look very unusual, resembling class 304 EMUs without pantographs. Bury has a new station, the bus and rail Interchange. Our trip was to run to the old station, Bolton Street, abandoned by BR in March 1980, and now home to the East Lancs preservation group. The last hundred yards or so of our run was in fact on East Lancs property, necessitating much activity by BR and E. Lancs staff before final arrival. The schedule had been extremely generous in the time allowed for the latter manoeuvre, so that even after an unscheduled photo-stop alongside the EMU depot, we were nearly 20 minutes early at Bolton Street, giving us plenty of time for a good look round. Standing at the head of a rake of maroon MkIs was a former Manchester Ship Canal railway Hudswell Clarke 0-6-0T, "Gothenburg", resplendent in bright green livery, ready to depart with a train for Ramsbottom. The East Lancs people have obviously put in a lot of work, though to reopen right through to Rawtenstall will take a great deal more. At 1150, precisely on time, we pulled away to head back down the branch to Manchester, travelling once again via Cheetham Hill junction into Victoria station. Again we reversed, and headed up Miles Platting bank, taking the junction at Phillips Park No.1 to Gorton, then out along the freight only single track to Old Trafford - the Fallowfield loop - passing en route the near derelict former electric depot at Reddish. We paused briefly at Manchester United football ground, where the only exit from the single platform is into the stadium, before retracing our steps as far as Phillips Park No 2. Here we took the line to Baguley Fold junction, where we retraced our much earlier route via Denton back to Stockport. We were now to head out into the country again, by travelling across to Altrincham and there take the former Cheshire lines route towards Chester. At Mouldsworth however we turned right for Helsby, where reversal was necessary again to head via Frodsham and Runcorn to Edge Hill. Our next objective was Aintree - the disused excursion platform, not exactly on a direct route from Edge Hill. 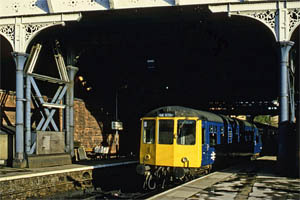 We were in fact to travel via a notorious "bomb alley" through the inner suburbs to Bootle, a freight-only route which last saw regular passenger traffic when the Southport connections for Euston trains ran to and from Lime Street in 1978. After negotiating the catacombs around Kirkdale (passing directly under the latter station) we crossed the Liverpool - Southport line, to run alongside as far as Seaforth. Just south of the latter station we climbed up and over the electric line to head along the freight-only route to Aintree, where we drew to a halt in the gathering dusk. To call our route "freight only" is not strictly correct, as some specials do in fact use it on Grand National days, though it is rumoured they will not for much longer. We now began our somewhat devious return journey, following at first our route back to Edge Hill, and on into Liver pool Lime Street to set down. We were not to return direct to Crewe - in fact we would not return direct to anywhere! We left Lime Street and ran normally to St Helens Central (formerly St Helens Shaw Street), again setting down, then reversed along the freight only line to St Helens Junction. From here we ran normally to Manchester Victoria, where we paused briefly, then on to Stalybridge for our last reversal. We now followed the route of the "shuttle" to Stockport, our last stop, according to the timetable, before Crewe. I now began to wonder about my awkward connection at Crewe - when we left Stockport, 8 minutes early, my hopes began to rise. The whole trip had been characterised by easy scheduling - would it last? As a result of our early arrival, I was home when, according to the schedule, I should have just left Crewe, and on the way home I reflected on the day's goings on. The Branch Line Society deserved much credit for the organisation of the day. The itinerary took the form of a 44 page A5 booklet, giving a extremely thorough description of the route, and the A3 size map was the best by far I have ever seen on a railtour. My fellow travellers? On the whole, an entirely reasonable bunch - good company for the journey. An excellent day out!